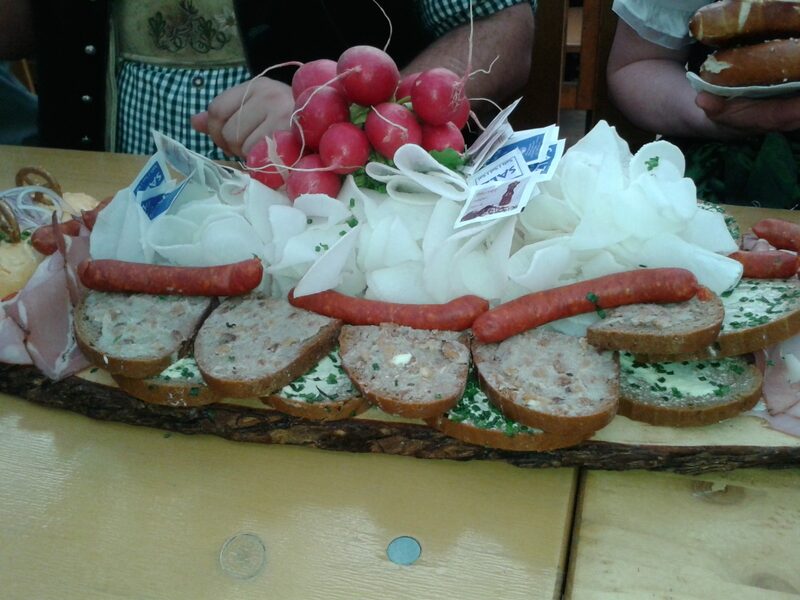 As every year the Contabo company joined the Oktoberfest – a must for every Munich based company. And so, two days ago, we all met in the Hofbräu tent where we have reserved three tables in the middle of the tent. You can imagine how great the atmosphere has been. Together with our colleagues of Nuremberg who came all the way to Munich to join us, we enjoyed good food and a couple of glasses of beer (or maybe more 🙂 ). We would like to say thank you to our management team who made this merry evening possible, but also to those colleagues who kept up the support in the meantime during the others were celebrating and dancing on the beer benches. 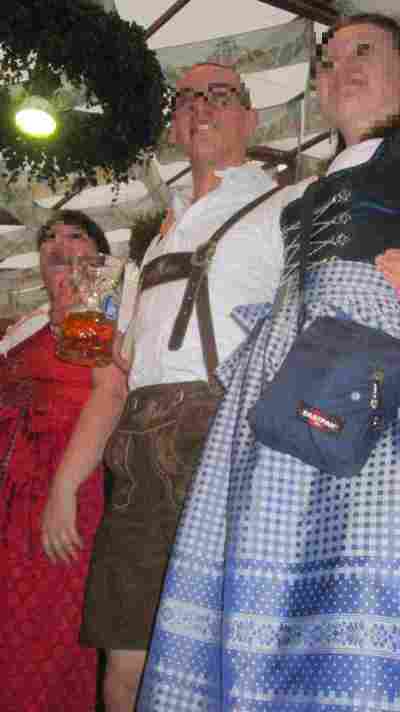 As every year Contabo took part in the annual Oktoberfest. It is nearly a must for a Munich company to join the biggest fair of the world. Dressed in traditional clothes we left our office towards the Hofbräu-Festzelt (one of the big tents). The atmosphere was great. 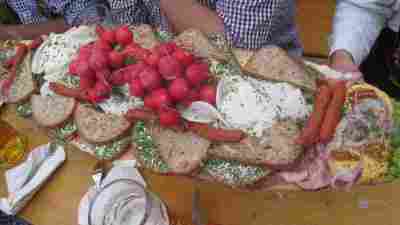 Besides beer (one of the main reasons to join the Oktoberfest) delicious food has been served. As a thank you for the great evening we bought a gingerbreadheart for one of our managing director. In the name of all Contabo employees we say thank you again. A traditional Get Together at the Oktoberfest! 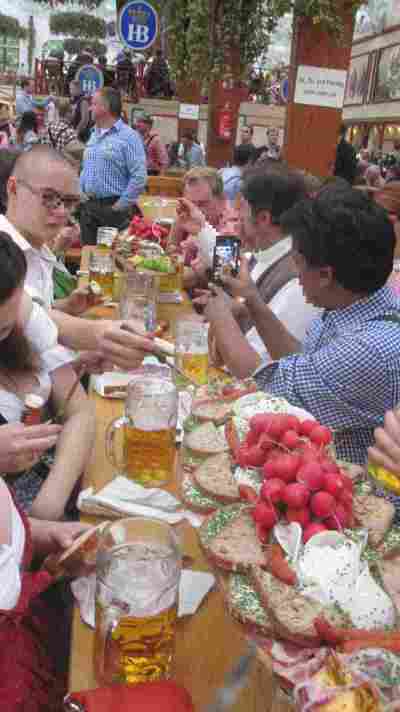 Like every year, Giga-Hosting spent an evening at the famous Oktoberfest. It is a fact that reserving tables for a whole company is very difficult on the all known Oktoberfest – but as a Munich hosting provider it goes without saying that we could manage to reserve a few tables for our team. And so we came together in the afternoon in front of the largest Oktoberfest tent called the Hofbräu Festzelt in order to spend a pleasant evening with typical Bavarian food like Brotzeitbrettl (a hearty snack), Obazda (typical Bavarian cheese), Hendl (roasted chicken), Kaiserschmarrn (sugared pancakes) and so on. There is no need to say that we all had one or two “Maß Bier” (glasses of beer) – but details about how many we all had at the end remain our little secret :-). For many of us it has been the first time in the quite touristic and very internationally oriented tent – but this is not a surprise because the tents’ patron is the world-famous "Hofbräuhaus", that is highly frequented by tourists from all over the world. But nevertheless you will find locals as well among the visitors (by the way the tent had room for nearly 10.000 visitors). A good mix, as we found, and also very reasonable on the one hand, because of our team coming from all over the world and on the other hand, because of our international located customers. All in all, the atmosphere was great and we were really happy to be there and to celebrate together as a team. Special praise goes to Lisa, Franzi and Uschi, our three excellent waitresses, who took care of us by providing food and beverages for us- despite the massive tumult in the tent. Once again, many thanks for this great service. Short after 11pm, when the tent has closed, our round departed – good for those who have to work the next day. Thus, we had enough time to recover from the pleasant exertions last night in order to leave a competent impression on our customers the next day. After all, customer satisfaction in all aspects is our highest priority, and moreover, as the saying goes: Those you can celebrate can work the next day as well. (Btw: Thanks to a colleague our data centre and thus, your server, has been in good hands because he was holding the fort while we were dancing on the tables. Thank you for the nice evening – we are already looking forward to the next Oktoberfest in 2013. 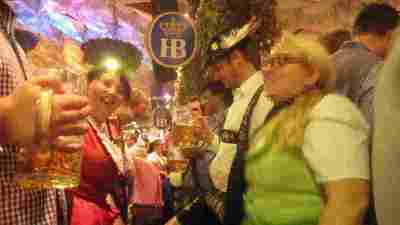 Being a native Munich Hosting-Team, it is one of our yearly recurring obligations, to visit the famous beerfest, commonly known as the Oktoberfest. Honestly admitting however, that this is of course one of the obligations we fulfill with pleasure. Keeping the good tradition alive, the Giga-Hosting team went once again to visit the biggest funfair worldwide. It is a pity however, that it becomes more and more difficult – for private visitors and companies alike – to book one of the tables in these huge beertents that are capable to hold a crowd of 5000 visitors and above. It is a matter of fact that the owners, respectively the designated Oktoberfest breweries, give preference to long term customers like prominent companies with hundreds or thousands of employees. The more we are proud that we had successfully managed to reserve tables during the most popular evening hours, thanks to the keen efforts of our staff. Many others, who had no reservation and less luck, were kept out from the fun, since tents were closed for being overcrowded. The first part of our team whom I joined, celebrated last week already at the "Augustiner Festzelt". It had been – and hopefully everybody who was there will agree – one of „a“ evening out, spend in relaxed atmosphere combined with excellent treatment of food and beverage. A big one to all these ever restless waitresses juggling heaps of chicken, pretzels and most important mugs through the dancing and moving crowd. And whoever had thought that such a jolly and boozy evening could not tickle any creativity and lead to concrete results, is herewith proven wrong. The worldwide first 19“ rack , fully conditioned by ice cold beer had been roughly sketched during the later evening and is about to be launched exclusively. By the way, we are still accepting any sponsoring offers from interested breweries. However, those who know how to party hardy , know how to work as well. And so, the second part of our team - who had not been on the Oktoberfest last week and who’s turn it is now to having a feast at „Bräurosl“, was on duty and in charge to assist and serve our customers until 23:00 hrs at the datacenter, as usual. Totally sober of course! Vice versa, you can contact the revellers of last week , tonight as always via telephone. Even during this probably most favourite time for the citizens of Munich, we provide the usual professional service. Pictures and Youtube-Videos about the very first beercooled serverrack worldwide will be provided later on, exclusively right on this blog. So, cheers and bottoms-up, or as we Bavarians say, „Prost“! Als waschechtes Münchner Hosting-Team gehört es natürlich zu unserer Pflicht, auch dem Oktoberfest einen alljährlichen Besuch abzustatten. Eine der etwas angenehmeren Pflichten freilich, soviel Ehrlichkeit muss sein. Wie schon in den letzten Jahren begab sich das Giga-Hosting.biz Team also auch in diesem Jahr gemeinsam auf das größte Volksfest der Welt. Genau wie für Privatpersonen ist es leider auch für Unternehmen im Laufe der Jahre unglaublich schwer geworden, abends in einem der weit über 5000 Personen fassenden Festzelte noch Tischreservierungen zu ergattern. Die Festwirte schenken oft jahrelangen Stammkunden, darunter auch Großunternehmen mit hunderten oder gar tausenden Personen, den Vorzug. Umso stolzer sind wir darauf, dass wir auch in diesem Jahr trotz des ungebrochenen Andrangs gekonnt über Schleichwege und mit tatkräftiger Unterstützung unserer Mitarbeiter tolle Tische zur Abendzeit ergattern konnten, zu der es für viele andere, arme Besucher ohne Reservierung nicht selten heißt: "Wegen Überfüllung geschlossen". Der erste Teil unseres Teams, zu dem auch ich gehöre, feierte bereits in der vergangenen Woche im "Augustiner Festzelt". Es war - und das kann hoffentlich nicht nur ich sagen - ein toller Abend in entspannter Atmosphäre und mit hervorragender Bewirtung von Speis und Trank 😉 , was wir natürlich nur der harten Arbeit unserer Kellnerinnen zu verdanken haben, die sich Stunde für Stunde, Tag für Tag, 17 Tage lang um genau zu sein, mit stapelweise Hendl, Brezn und vor allem Bierkrügen durch die Menschenmassen auf den Gängen kämpfen. Hut ab! Doch wer feiern kann, kann natürlich auch arbeiten. Und so stand der Teil unseres Teams, der nicht in der vergangenen Woche mit aufs Oktoberfest ging, sondern sich just in diesen Stunden in der "Bräurosl" befindet, selbstverständlich wie gewohnt bis mindestens 23:00 Uhr im Rechenzentrum für unsere Kunden zur Verfügung - garantiert nüchtern. Umgekehrt erreichen Sie heute Abend wie gewohnt via Telefon und Email die Giga-Wiesngänger der letzten Woche. Wir stehen Ihnen auch zur vlt. liebsten Zeit der Münchner, der Wies'n-Zeit, stets zur Verfügung. Fotos und Youtube-Videos zum ersten biergekühlten Serverrack der Welt werden wir an dieser Stelle exklusiv nachreichen.